Formerly the Holiday Inn Whistler Village Centre. A 115-room boutique property nestled beneath the peaks of Whistler and Blackcomb and in the centre of Whistler Village’s upscale restaurants, shops and galleries. Well-appointed guestrooms offer a comfortable and spacious getaway with all suites ranging from 400 – 700 square feet. Enjoy fully equipped kitchens and kitchenettes, fireplaces, updated bathrooms with jetted tubs and complimentary wireless internet. Other features include wheelchair-accessible suites, ski and bike storage, 24-hour front desk as well as a fitness centre with hot-tub & shower/change room facilities. If you’re looking for what’s happening in and around town, our round-the-clock hospitality team are able to share the inside track to ensure you experience all Whistler has to offer. 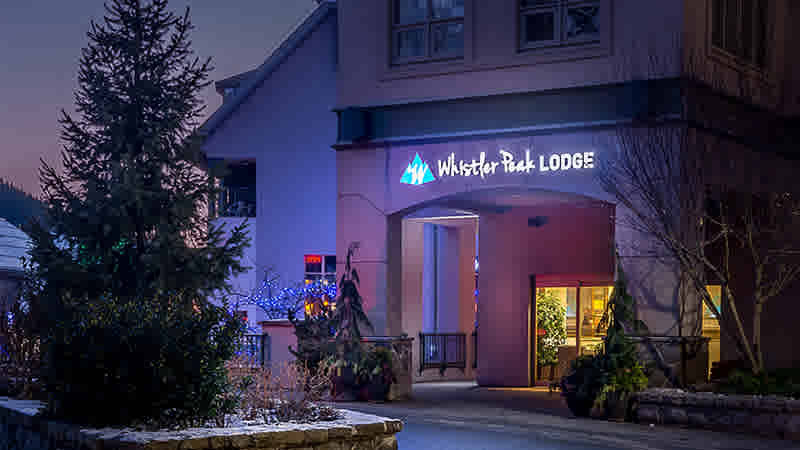 Whistler Peak Lodge - the perfect getaway for the urban adult. Studio: This cozy unit features a queen bed, kitchenette and fireplace. All rooms have cable, hairdryers, clock radios, complimentary in-room tea/coffee plus free wireless and wired internet access. Deluxe Studio: This versatile and spacious studio/suite is our most popular unit featuring a queen bed, a convenient double Murphy bed, fireplace and kitchen facilities. All rooms have fireplaces, kitchen facilities, cable, hairdryers, clock radios, complimentary in-room tea/coffee plus free wireless and wired internet access. One Bedroom Suite: One bedroom suites feature a separate bedroom plus a spacious living and dining area with a queen pull out sofa. The fully equipped kitchens also include a dishwasher and in-suite washer and dryer. Each unit features special bed configurations. All rooms have fireplaces, kitchen facilities, cable, hairdryers, clock radios, complimentary in-room tea/coffee plus free wireless and wired internet access. Two Bedroom Suite: Two bedroom suites feature separate bedrooms plus a spacious living and dining area with a queen pull out sofa. The fully equipped kitchens also include a dishwasher and in-suite washer and dryer. Each unit features special bed configurations. All rooms have fireplaces, kitchen facilities, cable, hairdryers, clock radios, complimentary in-room tea/coffee plus free wireless and wired internet access.